London, 1904 - All Artemis wants for her 16th birthday is a fancy new dress and maybe a few stolen sips of champagne. What she gets is a fiery sword and an inescapable destiny. She’s the Blaze—fated to protect the city from Darkness. With all of two days training, she must strike back against a rising evil. But her new powers come at a cost, and the truth behind them is more terrifying than any monster. Cinch your corset and strap in for a wild ride through turn-of-the-century London. 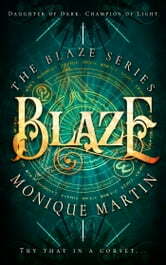 Don’t miss the next books in the Blaze Series. Mirror, Book 2 - Available now! As usual fast paced pilot great characters thoroughly enjoyable well done!